Dolly Parton's Dixie Stampede Dinner Attraction is a unique dinner and show experience set in an 85,000-square-foot arena facility featuring 32 magnificent horses, a stampede of Longhorn steer, dozens of cast members, ostrich races, illusions, music and more, all showcased in a friendly rivalry between North and South. With seating to accommodate over 1,000 guests, the show is complemented by a fabulous four-course feast. Pre-show entertainment features the comedy and juggling of Guinness record sport juggler, Albert Lucas, in the facility's Carriage Room. 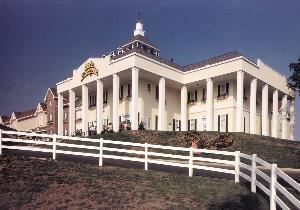 Dolly Parton's Dixie Stampede Dinner Attractions operate in three popular destinations: Pigeon Forge, Tennessee; Myrtle Beach, South Carolina; and Branson, Missouri. For general information regarding show times and ticket prices, call 1- *NOT DISPLAYED* or visit www.dixiestampede.com.